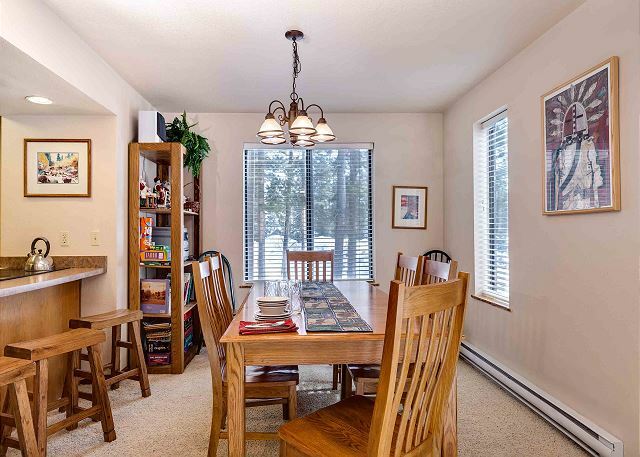 Open but cozy floorplan in the living, dining and kitchen areas. 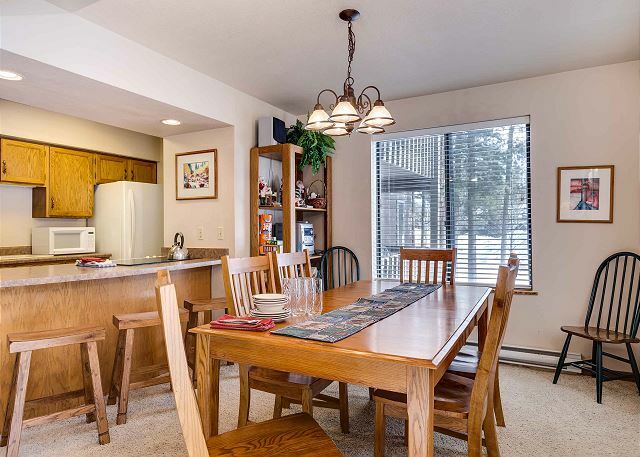 Enjoy home-cooked meals at the table or counter bar that seats 3. 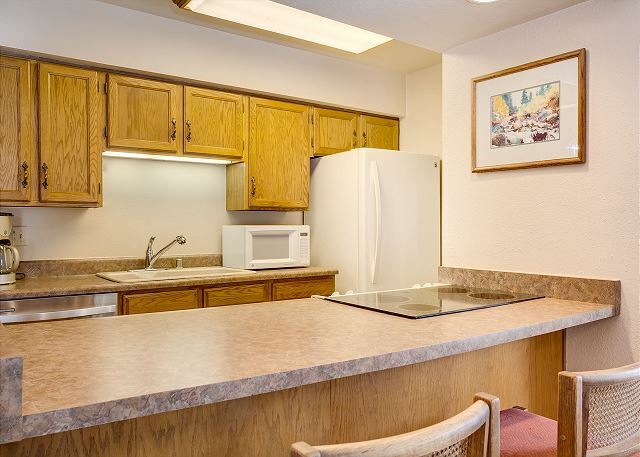 Save money by preparing all of your meals in this fully equipped kitchen. The kitchen is loaded with dishes, cookware and small appliances. The dining room features a new table, chairs and bar stools. Enjoy southern exposure on the small deck off the living room. Relax and watch a movie on the flat screen TV with cable and DVD player. 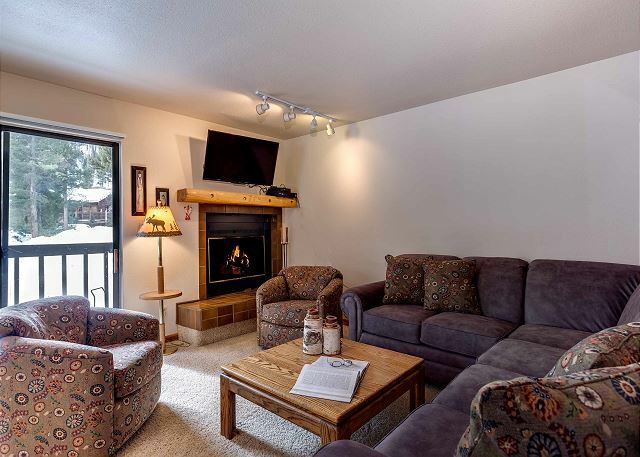 After a great day in the mountains, snuggle by the wood-burning fireplace. Relax and watch a movie on the flat screen TV with HD cable and DVD player. You'll sink into the new sectional couch and comfy swivel rocking chairs. Bedroom 1, ground level - Queen bed, closet and private bathroom with shower. There are 2 master bathrooms on the main level. This is a 3/4 bath. 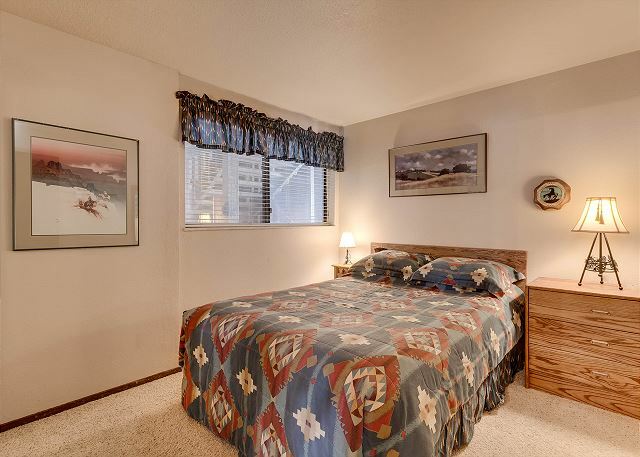 Bedroom 2, ground level - Queen bed, closet & private bathroom w/shower and tub. 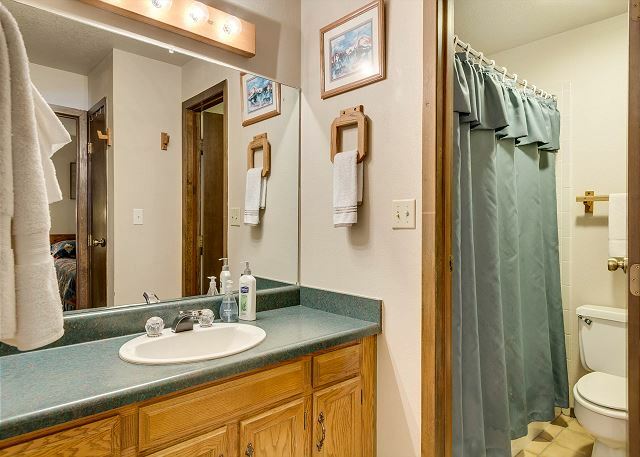 There are 2 master bathrooms on the main level - this one is a full bathroom. Bedroom 3, garden level - Queen bed, closet & full bathroom in the hallway. Bedroom 3 also has a dresser and old box TV. 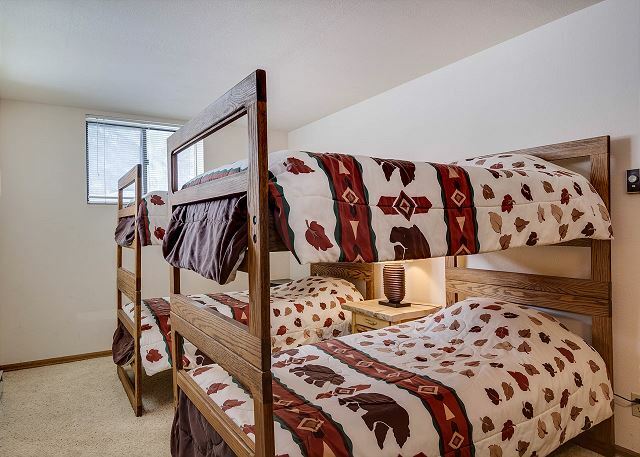 Bedroom 4, garden level - Perfect for kids with 4 twin bunk beds. 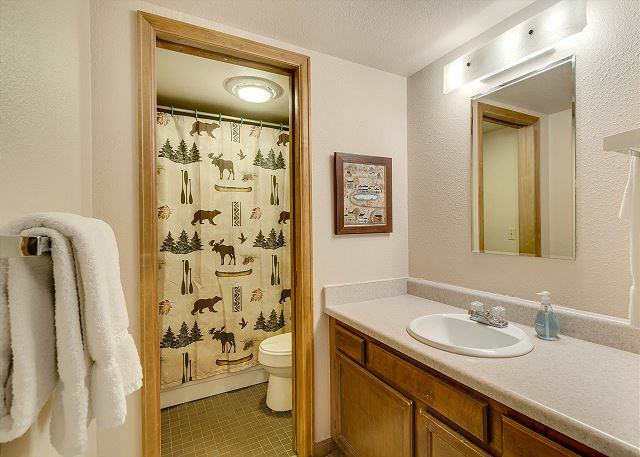 The two bedrooms downstairs share this full bathroom w/ sink & vanity separate. 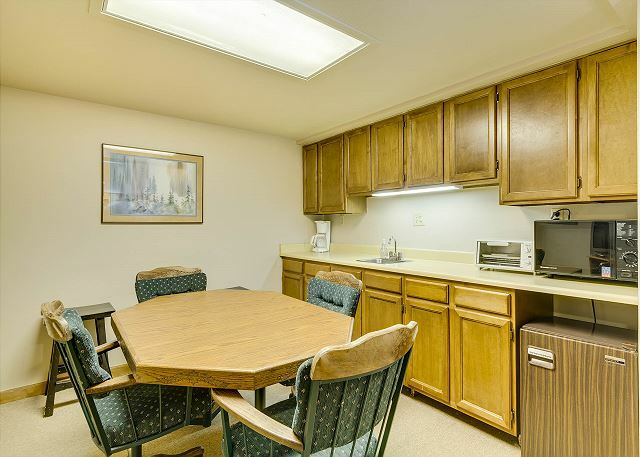 Enjoy the added convenience of a washer/dryer & kitchenette on the lower level. 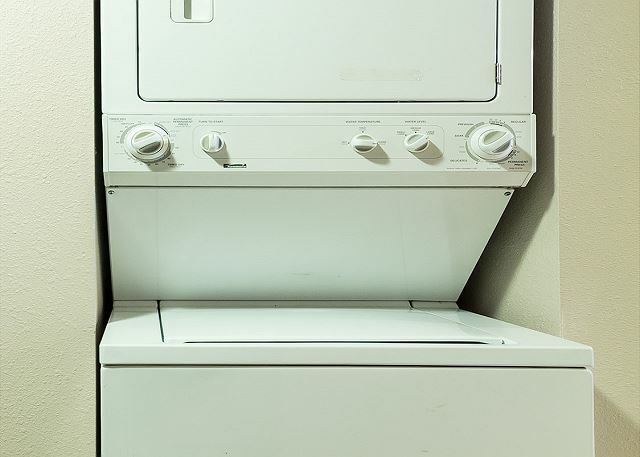 You'll enjoy the convenience of a washer/dryer in your unit. Peak One condos is a small complex located next to the Ten Mile Range in Frisco. 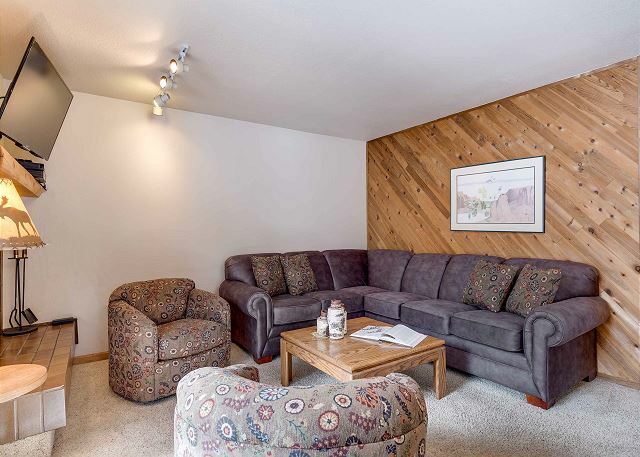 RECENT UPDATE: This condo now has a new sectional couch and sitting chairs that are quite comfortable in the living room and a beautiful new dining table and chairs. This large family style townhome in a residential neighborhood is so close to Frisco's historic central district that you'll be able to smell the BBQ smoke from the Main Street festivals. 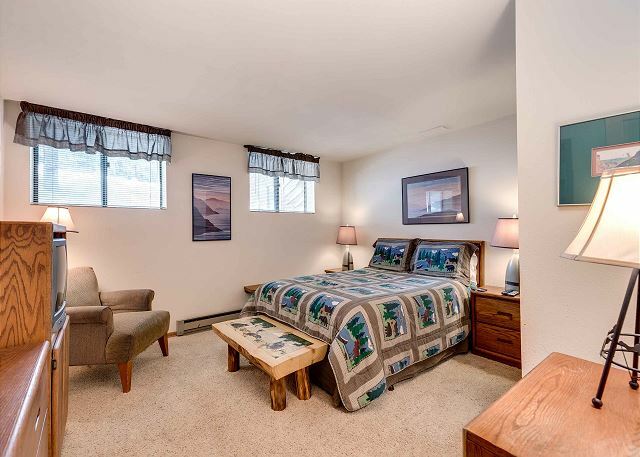 And this quiet four-bedroom is also just a few hundred feet away from the rugged Mt. Royal Trail, as well as regional bike paths leading to Copper Mountain and Breckenridge. 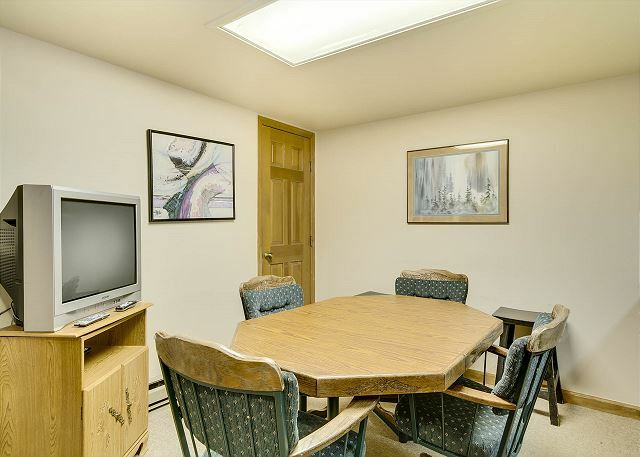 You'll buzz off I-70 and park in the pine-shaded lot in no time at all, and once you've unpacked, be sure to hook up to the free wi-fi, check out the local info station on the giant flatscreen TV or relax in front of a crackling fire. Up to 10 people can comfortably sleep in two upstairs bedrooms, each with a queen, and a downstairs master bedroom with another queen — right next to a bunk-room with room for four young mountain wranglers. 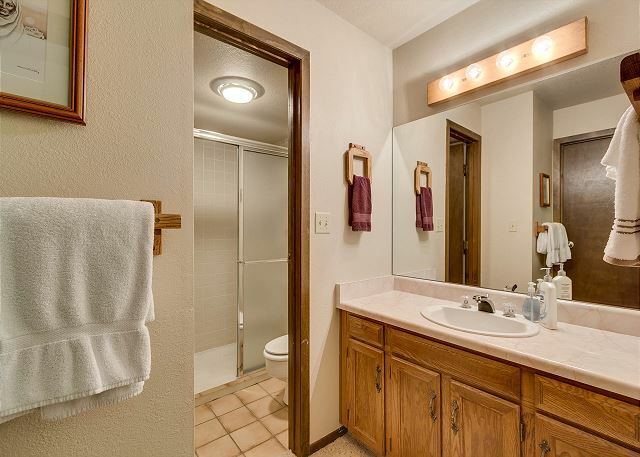 This spacious 1800+ square-foot home has 2 full bathrooms on the ground level and another full bath on the lower level. 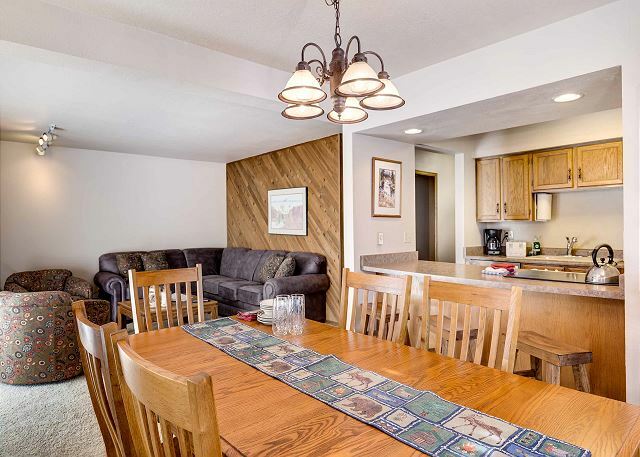 The full kitchen is on the main level, and you can use the convenient wet bar with dorm-size refrigerator and microwave on the lower level. 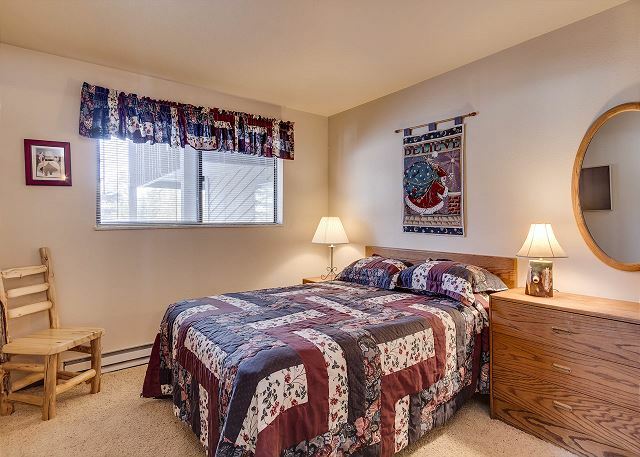 The master bedroom has a queen bed and private bathroom with tub and shower. The second master bedroom on the main level has a queen bed and also private bathroom with shower. 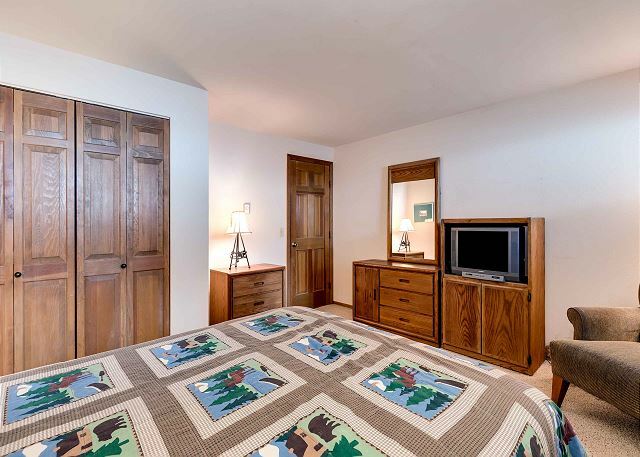 The third bedroom, downstairs, has a queen bed and TV with VCR, and the fourth bedroom is the kids' favorite, with 4 twin bunks. 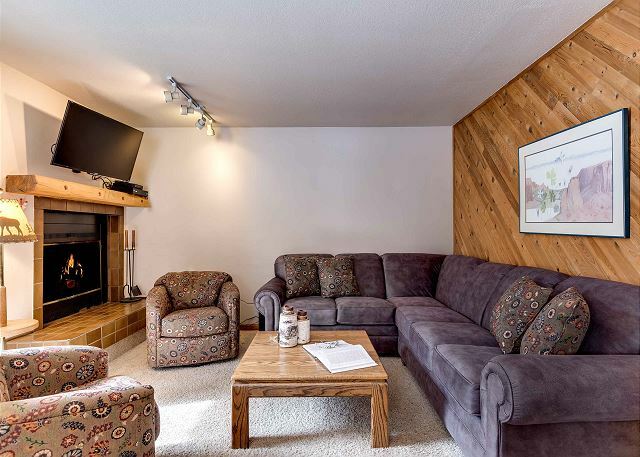 The living room includes a wood-burning fireplace and cable TV with DVD/VCR. You'll have a starter supply of firewood, so you can enjoy a cozy fire on chilly evenings if you wish. We understand the special needs of families visiting with children, so you'll find a pack-n-play and a highchair, along with some games, books and CDs to keep everyone occupied and happy. Copper Mountain, the closest ski mountain to Frisco, is known as Frisco's mountain. 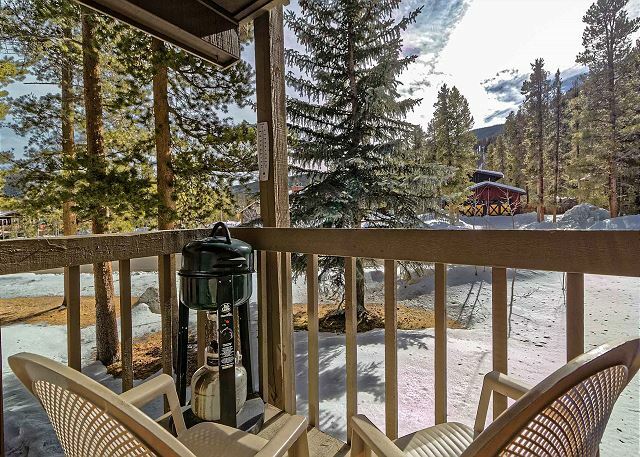 Copper Mountain, not more than 10 minutes from your Peak One condo, has long been known as "the skiers' and riders' Mountain." This condo is in a great location. 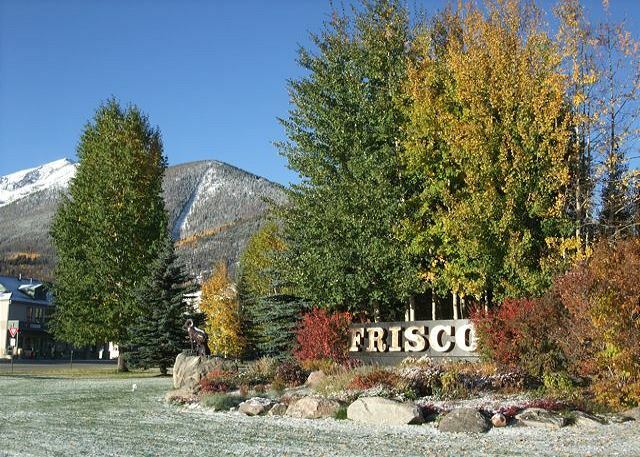 It is close to downtown Frisco and an easy drive to Copper MTN. There is a newer sectional sofa in the living room vs. what is in the picture which was a great surprise for additional seating. There was also a larger dining room table which was great for our family. All the bedrooms were decent size and there was enough living space to spread out/ separate if needed. A few of the mattresses need to be renewed but overall a great stay. The space is clean and in good working order. The management company was very responsive when called. Overall, I wouldn't hesitate to stay here again and would recommend this unit for larger families. This home was squeaky clean and comfortable. Lots of space for our group to spread out. Exactly as advertised and as shown in pictures. Yes, it's not remodeled, but who cares when you get such a great deal!! We didn't come to hang out in the condo. We didn't believe the deal we got for this prime location in Frisco. 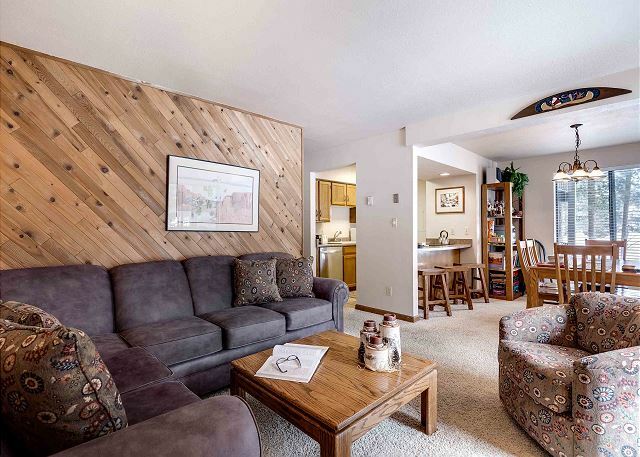 Just a few minutes walk to Main Street, and a few minutes the other way to the hiking trails. Very nice manager who was very helpful and responsive. Highly recommend this rental!!! (unless you're really uptight or want a luxury brand new place) We will definitely return to this rental for our future Frisco visits because of the location and excellent value for your money. Awesome home for all of us with ample space and great comforts. 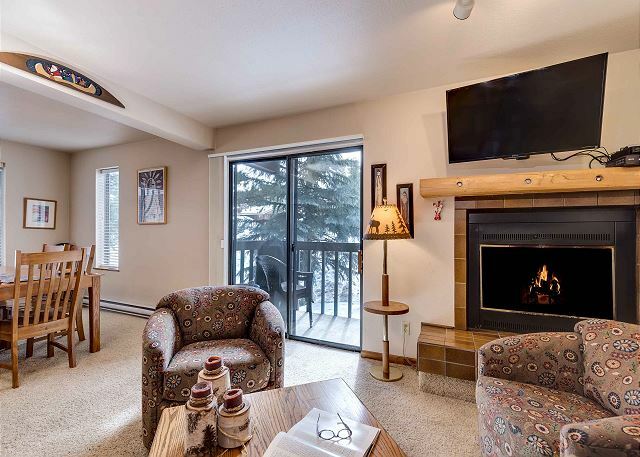 It is hard to find a condo that can accommodate a full team, this one was great. We thoroughly enjoyed our stay at this condo. Easy access to Breckenridge and Copper Resorts where we skied. It is close to shopping, and we were able to cook our meals in the kitchen. Nice place for a group. We had 6 adults and 4 kids(10 and 8) for a weekend. Plenty of room for everyone. Was within walking distance to downtown Frisco. 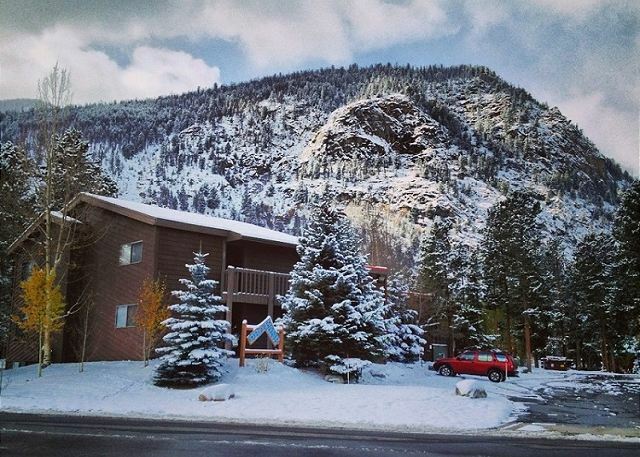 We rented this unit for 12 nights in mid-July. We had an extended family group of eight people. 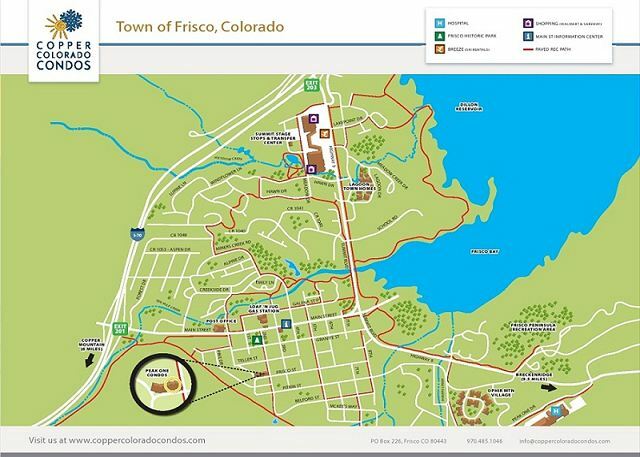 We love the location of the condo, because it is so very near downtown Frisco but also the regional bike path and hiking trails. This is the third time we have stay in this unit. Condo management was very responsive in solving a CATV problem the first day we were there.